Have you ever had one of those days that makes you question not only your sanity, but your very identity? Today was one of those days. Today ended with me losing a rib roast. An actual 3 pound piece of meat. Lost. Today was one of those days before it was even a day. I went to bed knowing that I had booked a client for 10 am. Uh huh. I went to bed knowing that I had agreed to drive my out-of-town-neighbor’s son to school. Uh huh. So today really started last night. I woke up this morning knowing it was time to get my”Organizer Mama” cap on. First, I rescheduled my client (and my assistant) for later in the morning. Luckily both my client and my boys’ school are close by. Problem one solved. Next, I called my neighbor and found out her son was already at a friend’s and I offered her daughters a lift to camp with my daughter. Second problem solved. My boys could walk to school when I left for work. So long problem three. Just as I was patting myself on the back, just as I was getting my daughter into the car to bring her to her camp while my boys ate their breakfast and packed their bags, just as I was thinking, “Nice work, Elana. You got this,” that’s when today happened, again. My youngest son reopened a cut that was stitched up a week ago. With howls of pain resounding in the background, I was able to quickly make an appointment with my angel of a paeditatrician. I bundled all three of my kids and two of my neighbor’s kids into the car and trooped over to the doctor. Luckily all was OK and I proceeded to drop the girls off at their various locations. My sons hung out with me as I ran errands for said client and picked up my assistant. Then they made their way to school as I got busy packing and doing what I love. As the work day ended around 3:30, I was feeling pretty good. I juggled several upsets and spent the day training a would-be-organizer. And again I risked the “You got this” self-affirmation. I suddenly realized I hadn’t seen my car keys in a while. While I frantically searched every pocket and surface, I also remembered that I was booked for both my girl and boy carpools. At the same time. At 4 pm. I immediately called CAA while checking all my car doors to check if maybe, please, I had left one open. But, alas. CAA was to arrive at 4:09. Time to start asking for carpool favours and apologizing to my assistant, who must have been wondering just how she chose what looked like the least together person to guide her in her would-be career. At this point, my client’s son decided to check things out and started fiddling with the doors, one of which opened. Yes, the one I hadn’t checked, of course. Once again, I had efficiently solved several problems and was cruising towards a really good evening. Some groceries, pizza and ice cream for dinner, and a night of cooking. And really, what else could go wrong? After a “Mom, you’re the best for getting us ice cream before dinner, and then pizza for dinner” round of applause, I was inventorying my fridge for ingredients when I realized that I couldn’t find the rib roast I had bought earlier. I checked the car, hoping the roast hadn’t been roasting in my car. It wasn’t. With a sinking sensation, I knew just where it was. In a grocery cart. At the store I went to after buying the roast. So once again, I hopped in my car and ran to the store to solve my final problem of the night. But, alas. The roast was nowhere to be found. Though the cashiers were trying to be helpful, I could tell they were waiting for me to leave so they could laugh at me close the store. I told you. Today was one of those days. So what did I learn? Besides the fact that maybe I shouldn’t be sharing all the ways I’m not quite acing life? I learned that some days are just going to be those days. It doesn’t mean I’m not who I thought I was. It doesn’t mean that I have to re-think everything. 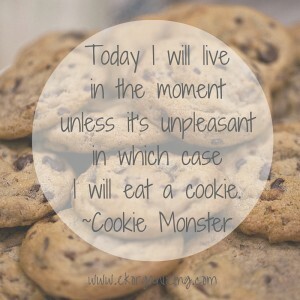 It simply means that there are going to be times when I just have to get into pajamas and eat lots of cookies and write what I think are funny blog posts that may help someone else who might be having one of those days. Fear not, friend. You are not alone. As for the roast? I’d rather have cookies anyway.